NOTE: An error was made in the women’s 60-meter hurdles individual event rankings that affected the National Team Computer Rankings. The PDFs and rankings table below reflect the updated rankings. NEW ORLEANS — Don’t look now, but with each passing week Arkansas is getting stronger. For the third consecutive edition of the U.S. Track & Field and Cross Country Coaches Association (USTFCCCA) National Team Computer Rankings, the defending national champion Razorbacks extended their lead over second-ranked Georgia. Arkansas gained 19.29 points since the last rankings, giving Lance Harter’s top-ranked squad a grand total of 209.40 points. So even though the Bulldogs also added points to their total — 6.56, to be exact — the Razorbacks pushed further ahead. The National Team Computer Rankings are complied by a mathematical formula based on national descending order lists. The purpose and methodology of the rankings is to create an index that showcases the teams that have the best potential of achieving the top spots in the national team race. Rankings points do not equate with NCAA Championships team points. A full description of the rankings can be found here. High marks from the previous season are counted until the third poll of the regular season, which is scheduled to be released on February 8. After that date, only marks from the current season are included in the USTFCCCA National Team Computer Rankings. It should also be mentioned that the USTFCCCA National Team Computer Rankings should not be referred to as a “poll,” as no voting occurs during the process. What shot Arkansas further ahead? Well, the emergence of sophomore Taliyah Brooks. This past weekend at the Razorback Team Invitational, Brooks scored 4457 points in the pentathlon which moved her up to No. 8 on the all-time collegiate list. At the same meet, Georgia’s Chanice Porter soared 6.58m (21-7 1/4) in the long jump. That put Porter third on the USTFCCCA Individual Rankings and gives the Bulldogs a solid one-two punch with her and Bowerman Watch List member Kenturah Orji. Behind Arkansas and Georgia, Oregon and Florida played leapfrog with Texas and Kansas State. The Ducks and Gators (last week’s No. 5 and No. 6 teams) are now No. 3 and No. 4, respectively, while the Longhorns and Wildcats (last week’s No. 3 and No. 4 teams) are now No. 5 and No. 6, respectively. Oregon knows what to expect out of its sprinters (Hannah Cunliffe, Jasmine Todd and Ariana Washington) and mid-distance athletes (Alli Cash, Brooke Feldmeier and Raevyn Rogers), but Sasha Wallace made a name for herself this past weekend. Wallace clocked 8.05 in the 60 hurdles and is now fourth on the leaderboard in that event. 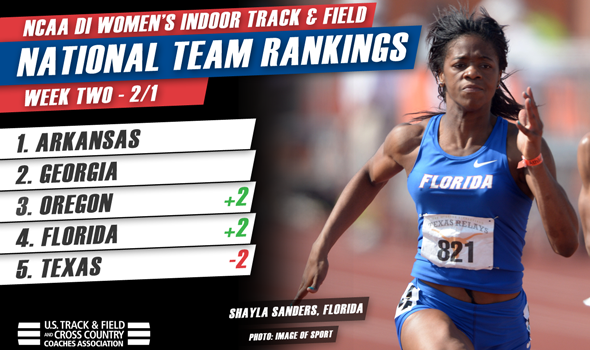 Florida had two athletes shine this past weekend — Darrielle McQueen and Shayla Sanders. It was in the triple jump where McQuee soared 13.36m (43-10) and moved up to second on the leaderboard. Sanders blistered the track with a 7.17 in the 60 and is .02 seconds behind Todd in that event. Two other teams making serious headway in the USTFCCCA National Team Computer Rankings were NC State and Stanford. The Wolfpack jumped from No. 19 last week to No. 8 this week, which is the loftiest billing in program history for them. The Cardinal moved up four spots from No. 14 to No. 10 and are back in the top-10 for the first time since Week 3 in 2015. NC State received incredible performances by sophomore distance standout Wesley Frazier and senior thrower Nicole Chavis. Frazier made her debut at the Camel City Invitational, set a school record in the 3000 and took over the top spot on the national leaderboard by more than 10 seconds. Chavis bombed the weight 21.91m (71-10 3/4) en route to a win at the Vanderbilt Invitational and a national lead. Another contender for biggest mover of the week was Oklahoma State. The Cowgirls, behind junior mid-distance star Kaela Edwards, went from outside the top-25 to No. 22. Edwards, an accomplished 800 runner (ranked No. 1), scorched the field in the mile at the Razorback Team Invitational and took the win in 4:32.14 (now No. 1 on the leaderboard). The SEC continues to dominate the National Team Computer Rankings as there are eight programs in the top-25 (three in the top-4). Falling behind the SEC are the Big 12 and ACC with four each.